Emelia Eller, ER 60, is from Austin, Texas and St. Louis, Mo., but has spent the past few years as a resident of Pinon House. She said success at Eagle Rock showed itself in the form of a letter she wrote to herself of all the things she wanted to accomplish while at Eagle Rock. A year later, she said, almost all the items on the list had been checked off. Emelia was involved in PDC work as an intern, participated in the backcountry Yurt trip and the musical Spring Awakening. She suggests students be honest with everything, because it makes for fewer regrets and the ability to move on. And speaking of moving on, while she has no firm plans, Emelia is nonetheless looking forward to seeing what options come her way. Daisy Delgado, ER 61, is a Californian and was an Aspen House resident until Friday. In addition to art and choir, she received an Eagle Rock Excellence Award for her consistently high performance. Daisy said what worked for her at Eagle Rock was taking care of her business and staying positive. She suggests future Eagle Rock students stay away from drama and not talk about others. Daisy intends to practice that advice when she starts classes at a community college near her home in California. Joey Flores, ER 56, is another Californian, hailing from the San Fernando Valley. While at Eagle Rock, Joey lived in Aspen House where he says he had a strong relationship with his boys’ wing. He was a mountain biking co-instructor and crew leader, participated in the Yurt and the Green River trips, and enjoyed rock climbing and participating in a National Outdoor Leadership School (NOLS) trip in Vernal, Utah. He agrees with Daisy that students should refrain from drama, also suggesting that they “don’t do relationships.” His future plans might include becoming an Outward Bound instructor, or staying in Colorado, or going to school, or working with a friend who’s starting up a company (and he’s not ruling out applying for a spot on a National Forest Service Interagency Hotshot Crew). Cristian Aguiluz, ER 61, is from Los Angeles and was a Juniper House resident who played on the basketball team and prides himself on having less than three dings each trimester and participating in the Berklee College of Music Five Week summer program. His advice to Eagle Rock students is to live in the moment while in the Rockies, because “time really flies here.” Cristian will be attending Santa Monica College after graduation. Bryan Yanez, ER 62, is another Californian from the San Fernando Valley, and a Spruce House alumni. He counts among his successes graduating, being a wing leader, KP leader and participating on a NOLS course. He suggests students push themselves toward success, adding he’ll do just that when he joins the Glen Haven Fire Rescue team after leaving Eagle Rock. Kira Sinclair, ER 60, hails from Austin, Texas, and was a Lodgepole resident at Eagle Rock. Her highlights included doing service on a Native American reservation in South Dakota, performing at the Dao House’s haunted Halloween, and participating in a lot of service work — from helping out during the Colorado floods of 2013 to planting trees. Aaron Beckles, ER 61, prides himself with being a good house leader at Lodgepole, where he said he had a great support team. The Boston, Mass. resident, had several leadership roles at Eagle Rock including KP, basketball morning exercise, poetry slams and work with the PDC. His advice for those who follow includes reflecting on your actions to make yourself a better person. He also suggests staying away from fast food eateries and markets, because that’s a waste of your money. Aaron will be taking business management classes at Newbury College in Boston. Saben Hinckley, ER 60, was another Lodgepole resident; he hails from St. Petersburg, Fla. 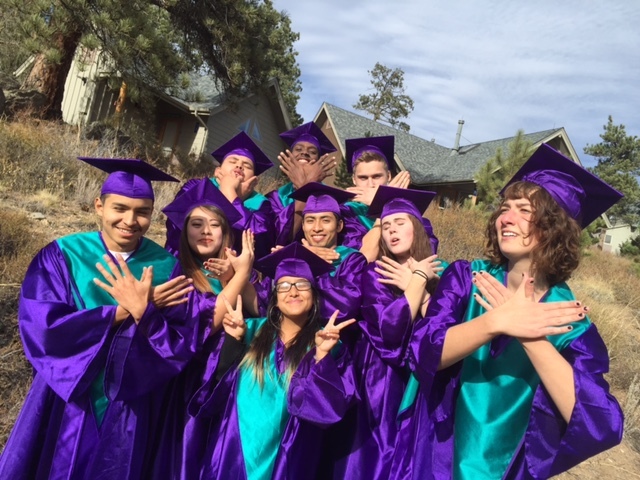 While at Eagle Rock, Saben was a lead student ambassador who participated in Eagle Rock’s production of Spring Awakening, and enjoyed improv, choir, a capella, and planting a fake tree in the Eagle Rock greenhouse. In addition, Saben enjoyed lifting weights, playing instruments, music, working in the greenhouse, and focusing energy on things that make a difference in the community while enrolled at Eagle Rock School. After a stay with his family, Saben will head off to St. Petersburg College. Congratulations and good luck to all of our recent graduates. This entry was posted in Eagle Rock Alumni, Life After Eagle Rock, Meet The Student and tagged Aaron Beckles, Ashalou Harrison, Berklee College of Music, Bryan Yanez, Cristian Aguiluz, Daisy Delgado, Emelia Eller, Glen Haven Fire Rescue, Graduation, Joey Flores, Kira Sinclair, Newbury College, NOLS, Outward Bound, Saben Hinckley, Spring Awakening, St. Petersburg College.